I had a couple of wines last night that impressed me. Let me talk about the Cellar No. 8 first. This is a wine from the Asti winery in Sonoma. This label offers a very good QPR for what it is. 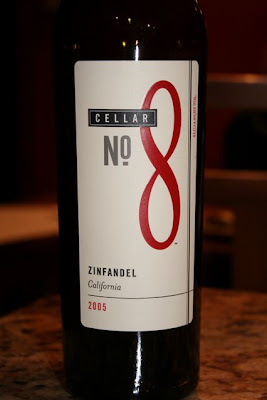 They are not serious wines but are certainly quaffable and I picked up a few bottles of the 2005 zinfandel on a sale for $8 last week. So many of the zins today are coming in with way high alcohol and big candy-like fruit. Sometimes I feel like I’m drinking dessert wines, they are so sweet. I have been missing that black pepper that first made me fall in love with this grape. Well, for an everyday wine, the Cellar No. 8 brings something to the table. It had a nice cherry and raspberry nose but it was the black pepper on the palate that won me. I love that! It wasn’t super complex but it certainly had a good structure. Dark fruits, raspberries and plums were present and it had a nice acidity that was obvious. It also had a nice clean lingering finish that was quite pleasant. Overall this was a good buy at $8. Let’s get a little bit more serious now. 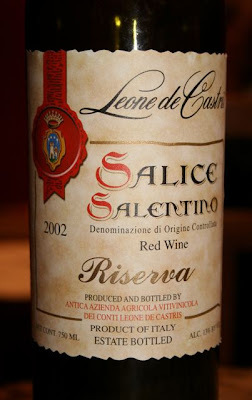 I don’t remember where I picked up this Leone de Castris Salice Salentino Riserva, but it’s been in my cellar for a while. Current wisdom (aka cellartracker) suggested that the drinking window for this wine was between 2005 and 2007, so I popped it open and decanted it for an hour. This was an interesting wine. Full of an earthiness mingling with red fruits on the nose and the palate. It had very smooth tannins and a good weight in the mouth. I noticed hints of asparagus and sour cherries too. Quite complex and difficult to describe. Definitely an old world style that I very much enjoyed. It paired well with a green olive stuffed chicken breast and polenta.